Sell My Galaxy Tab S 8.4 SM-T700 | How Much is My Galaxy Tab S Worth? How Much is Your Galaxy Tab S 8.4 Worth? Sell your Galaxy Tab S 8.4 for top dollar at GreenBuyback. Select the information above in order to receive an accurate quote for the Galaxy Tab S 8.4 you want to sell. Click sell item if you agree with the price that is displayed. GreenBuyback purchases cell phones, tablets, and laptops at the highest prices in the industry! GreenBuyback pays cash for your old cell phones, tablets, and laptops. When you sell your cell phone, tablet, or laptop to GreenBuyback you will never have to pay shipping. GreenBuyback is dedicated to maximizing the cash back to our customers. 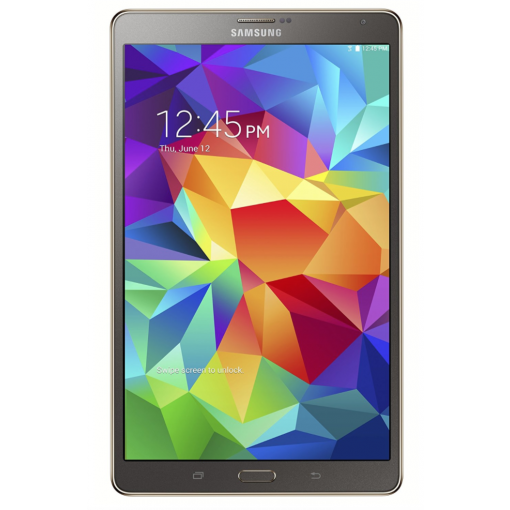 Sell your Galaxy Tab S 8.4 for cash today! Samsung’s smaller Tab S tablet was originally launched in July 2014. The sleek design and powerful Exynos 5 octa-core processor make for a tablet comparable to the iPad Mini. The Tab S 8.4 tablet is thinner and the body is made of plastic making it a lighter option to the iPad Mini, coming in at 10.67 oz. The tablet is Wifi only and has two storage size options available —16GB and 32GB. Both models can be modified up to 128GB using a mircoSD card. Selling a Galaxy Tab S 8.4 is so easy with GreenBuyback; send your Galaxy Tab S 8.4 to GreenBuyback with free shipping and you’ll get cash sent to you fast! The display is great for viewing shows and movies with a 359ppi. Battery life is estimated to support a full day of browsing the web or catching up on your Netflix queue. The tablet’s rear camera is 8 mega pixels and features a slightly less powerful front-facing camera, which will come in handy for those all those selfies we know you take! GreenBuyback will buy your Galaxy Tab S 8.4 in any condition, even broken! Simply head to GreenBuyback to get a quote, send your Galaxy Tab S 8.4 in, and get cash quick!